Best non-Italian crew was 7-man crew of "Jovo Dabovic" boat club from Baosic, which arrived at the City Port with its 12-meter long sailboat at 13:06:35, after sailing across Adriatic Sea for a little more than 24 hours. "Terra da mare" race is estimated to have brought around 500 people to the city. 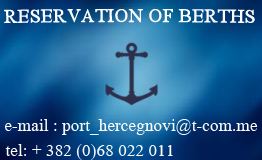 On April 29th, traditional Herceg novi Cup was held in Boka Kotorska aquatorium. Fastest boat was Black Mistery, with Sasa Kekovic leading the crew.